In memory of Oliver, Primarily Primates and Project Oliver are hoping to raise funding to build a large enrichment habitat and playscape for several of the chimpanzees at the sanctuary. This grass bottomed habitat will feature a cupola at the top where chimpanzees can view the sanctuary from above the treetops. 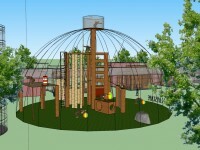 It will also feature various climbing structures and other elements to give the chimpanzees a more enriching experience. “Sky Tunnels” will allow 2-5 chimpanzee groups to take turns enjoying “Oliver’s Playscape.